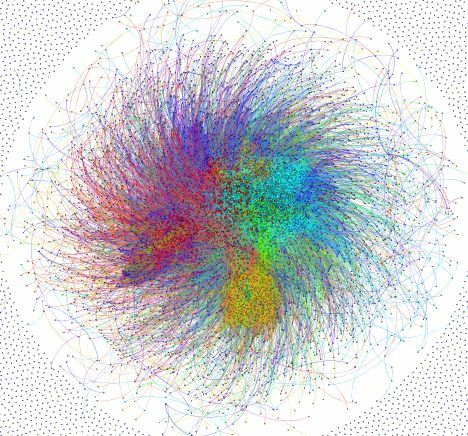 Showing someone a view of their organisation of over 2000 people rendered in Gephi might produce an initial ‘wow’ but they can then struggle to make sense of it. A better approach might be to summarise the information by amalgamating the nodes into departments (or whatever organisational unit is meaningful). The following graph shows the organisation I have illustrated before but broken down into ‘departments’, the sizes of the nodes are proportional to the number of people in the department and the widths of the edges are the totals of all the weights from each underling edge between two groups of underlying nodes. To amalgamate the data I created a query that assigns each node ID (from the underlying SQL database) to a group which is then used to summarise data using in-memory hash tables; this has the advantage, over a SQL ‘group by’ clause, of creating arbitrary groups independent of the fields in the select clause. Looking at the graph you can immediately see strong ties between IT and Ops but BU 2 looks a bit isolated given its size. This entry was posted in gephi, Social Network Analysis and tagged gephi, Social Network Analysis on April 16, 2013 by Robert Gimeno. For organisations using Web Services on Microsoft Servers the IIS logs can prove a useful resource. Firstly it’s possible to build a dependency map showing which servers are dependent on services on a given server. Using the Gephi timeline feature it’s also possible to show how the traffic changes over the course of a day, or whatever period. The Gephi graph below shows data collected from a number of servers over an 18 day period. The edges have been weighted with a logarithm of the number of calls received per minute. The colours represent clusters detected by Gephi and not derived from any information about the server. Now you might think an IT department will know all the dependencies between servers; well maybe it should but this exercise did reveal a few surprises and even if it did not it is still a worthwhile exercise to validate dependency information. 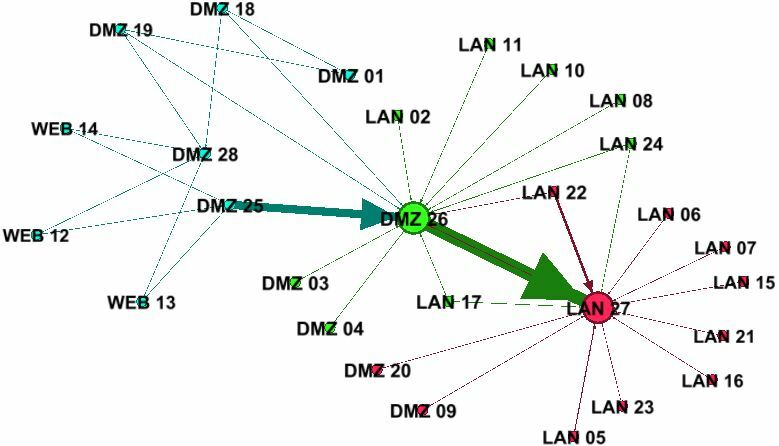 All very interesting but can IIS logs help build a picture of Social Networks? Well I’m not sure as I’ve not tried but it lets you see who used what and when, well certainly for internal apps. People who use the same app around the same time or with similar usage patterns are probably doing a similar job so may know each other and, if they don’t, maybe they should. This entry was posted in gephi and tagged gephi, Microsoft IIS on March 22, 2013 by Robert Gimeno. I’ve been taking a look at how to get graphs displayed in a browser. Here is the data I’ve been describing in previous posts; I can’t go into much detail about the meaning of this graph except that each node is an email account. 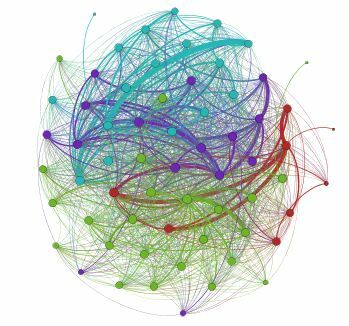 This entry was posted in email, Social Network Analysis and tagged gephi, Social Network Analysis on March 15, 2013 by Robert Gimeno. A colleague said to me today ‘oh that department has a number of factions’. Hmmm, did the data reflect this….I loaded data for just that department into Gephi (the data combined email, meetings, projects and hierarchy to deduce the social network). I ran Modularity and sure enough four partitions popped out. My colleague took a look at the names in each partition and said ‘yeah, looks about right’. 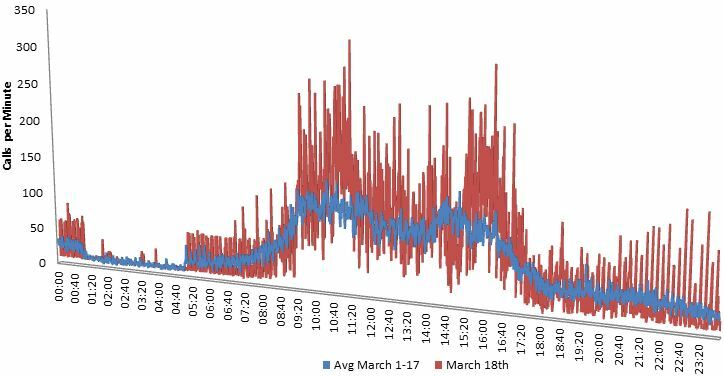 Here is the Graph coloured by the community detected (anonymised). This entry was posted in gephi, Social Network Analysis and tagged gephi, Social Network Analysis on March 14, 2013 by Robert Gimeno.